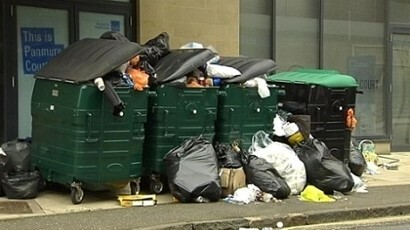 An Edinburgh refuse worker describes the background ther dispute with the council, the workers' collective action, and the council's attempts to break the strike. Taken from the second issue of the Edinburgh Muckraker. I might add that manual workers would currently be comfortably eligible for Legal Aid, so they are just your average Joe! Would YOU accept this from your employer? So, the wage cuts ad changes in conditions aren’t just affecting the cleansing department workers? No, it’s all the manual workers, it involves the school dinner ladies for example. One of the dinner lady supervisors was told she would have to cover two schools on her own! We understand that you, the workers, are banning overtime and working to rule, that is following health and safety rules. Could you describe what the Council are doing to try to break your action? People are working a full shift then not getting paid. Bin men have had the WHOLE day’s wage docked, despite working the full shift. Then the following day they are told they must sign a form admitting they were guilty of ‘partial performance’ or they will be sent home without pay and won’t be allowed to return to work until they sign it. Some workers still refused to sign, and weren’t paid for several days. Harassment, bully-boy tactics and a form of blackmail were employed to coerce workers to comply. Management ignored all normal disciplinary procedures, there were NO verbal warnings, NO written warnings and NO information on rights of appeal were offered! The workforce do not wish to disrupt the good citizens of the Burgh, they are only trying to carry on working for a fair day’s pay. Indeed they are working to the management’s Health and Safety manual, which the management are now ordering the depot supervisors to order the workers to ignore—their own rules, endangering workers’ lives. Are the management using any other tactics against you? Yes, workers who have had to be signed off by their doctor due to stress of intimidation at work are also being docked their wage. This is completely illegal, the Council are now setting themselves above the law and believe they are more medically qualified than a GP! About half the workforce at my depot are off sick, they’re stressed out their minds. About 40‒50 workers have had their wages docked, either for so-called ‘partial performance’ or for being off sick. Now the dispute is not just about money, it’s about all the persecution and victimisation, all the management bullying. They think they’re above us all. They think we’re all a bunch of numpties and won’t stand up for ourselves. What are your working conditions like? Well, we recently experienced a monsoon season, and workers are having to return to a depot which has no facilities, i.e. no showers, no drying facilities, no canteen, and having to travel home by public transport in soaking-wet clothes. Is this the 21st century, these conditions would seem not out of place in 1909! Would you subject one of your loved ones to these conditions?